Emile Laliberte poses in his Halloween costume in Montreal, on Oct. 28, 2018. In Halloweens past, 10-year-old Emile Laliberte struggled to find a costume that wouldn’t be hidden by his wheelchair. 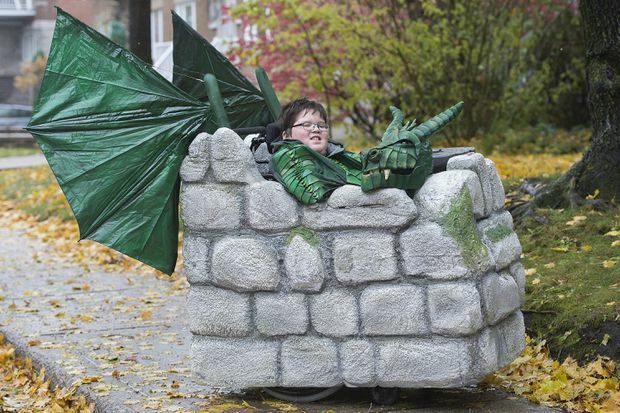 But Emile looks to be the envy of all the children on his block as he sets out trick or treating on Oct. 31 as a green dragon with 3D-printed scales, motorized wings and glowing animated eyes to watch over the Styrofoam castle that surrounds his wheelchair. Handyman Robert Murphy said the costume, made in collaboration with Concordia University’s Milieux Institute for Arts, Culture and Technology, is the first in what the group of Montreal crafters hope will become a holiday tradition. Next year, Chad the dragon – a name picked by Emile – will be passed on to another kid as the team embarks on its next wheelchair-customized Halloween creation. The project, which is called Rolloween, is part of a growing push in Canada to make the frights and delights of Halloween more inclusive for children with disabilities and special needs. In a Vancouver suburb, Lucille Ayers said thousands of people flock to the Coquitlam Halloween House over 12 days of wheelchair-accessible thrills including a pumpkin patch, graveyards, fortune tellers and eerie effects. Ayers said it’s her 19th year of turning her home into a house of horrors, and all proceeds have been donated to Variety, a charity for children with special needs, which is why it was important to her family that the spooky attractions were accessible. That mission extends to the adult volunteers who help out with the event, said Ayers, many of whom have special needs. In Toronto, Frolic’s Haunt aimed to accommodate as many visitors as possible – recruiting ASL interpreters, ensuring there’s enough light for visually impaired guests, and avoiding ableist props like straight-jackets – for its one-day event, which was cancelled Saturday on account of bad weather. Allan Marriage, who works at Toronto’s Holland Bloorview Kids Rehabilitation Hospital, said a haunted house would be too much for his scare-sensitive eight-year-old son, Liam, who spent the summer making a costume inspired by the video game Minecraft that would work with his mobility device. Marriage said there are simple adjustments parents can make to ensure that kids with disabilities can enjoy the sugar rush of Halloween, such as bringing the bowl of treats down to the driveway where children in wheelchairs can reach them, and going easy on the effects so as not to overwhelm those with sensory issues. But more than costumes and candy, Marriage said children with disabilities want to trick or treat with other kids.